anaildapinto has 44 positive feedback, 1 neutral feedback and 0 negative feedback, for an overall percentage of 97% positive feedback. Positive feedback from sparkmongoose on Thu, 22 Sep 2016 16:02:18 -0500 for this transaction: I bought from anaildapinto. I commissioned three 2.5D figures from them, of Mars, Cyrus, and an OC of mine. They did a great job staying in contact, and I really like the commissioned figures! The surprise gift was wonderful, too! Positive feedback from ibburger on Sat, 11 Jun 2016 11:08:21 -0500 for this transaction: I bought from anaildapinto. Positive feedback from mizunosakura on Sat, 7 Nov 2015 16:18:24 -0600 for this transaction: I bought from anaildapinto. Ana offered to make me new ones for free which was very nice and so she began! She started with just making and sending the simple ones first to make sure they weren't lost again. As for the originals... to my surprise, they actually arrived today--about a year later--with everything intact. Positive feedback from methuselah31010 on Mon, 26 Oct 2015 13:01:11 -0500: I bought from anaildapinto. Great communication and fast shipping. Thanks! Positive feedback from silverinfinity on Sun, 26 Apr 2015 14:12:15 -0500: I bought from anaildapinto. Positive feedback from jehoshabeath on Mon, 19 Jan 2015 09:31:45 -0600 for this transaction: I bought from anaildapinto. Positive feedback from nosidamsucram on Sat, 3 Jan 2015 14:53:12 -0600: I bought from anaildapinto. Positive feedback from dwnshadylane on Mon, 29 Dec 2014 19:53:41 -0600: I bought from anaildapinto. I bought a custom forever yours keychain featuring Arcanine and Furret. After the first keychain broke (the wood near the metal grommet broke off) she was kind enough to make a replacement with sturdier wood. I appreciate all that was done for me and I would recommend her and buy another keychain in an instant! Neutral feedback from opossumpanda on Tue, 2 Dec 2014 14:55:20 -0600: I bought from anaildapinto. 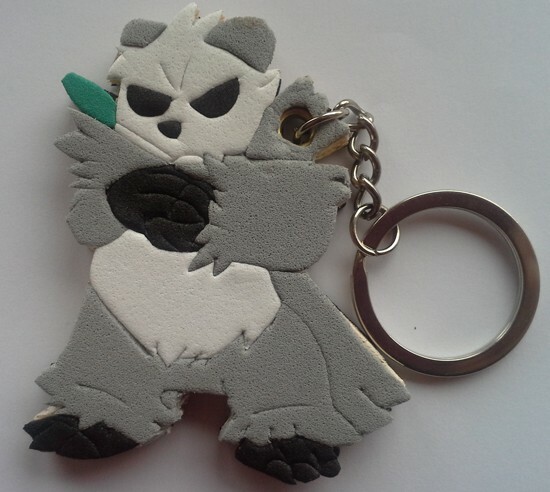 Commissioned them for a foam keychain they make of Pangoro and I wouldn't feel right leaving positive feedback because I don't feel it was a totally positive experience. Wouldn't consider buying from them again. I was on their list since September 1st. Two months go by until I receive the sketches from her via email (October 30th), and she hadn't explained why until I asked about the lack of email - before the email, on Sept. 29, I had asked if she had even sent an email yet because I hadn't received one in so long and thought it may have went in my junk folder. She replies saying she'll work on it that week. 13 days later she sends me a comment through LJ and I come to realize her second email with her payment information had been sent to my junk folder and deleted, I looked through my deleted emails and eventually found it. She waited two extra weeks, ontop of the almost 2 months I'd waited, to contact me. It annoyed me, because I had responded to her first email ASAP, and I'd think she would realize her other ones weren't going through. It disappointed me, it looked wonky, but I told her and she actually redid it. I appreciate this a lot. I received it today, and I do like it, but the coarkboard that she uses for the background shows easily on the sides and makes it look half completed. I'm painting around the edges with black to make it look more complete. It would be nice, imo, if she were to do this herself. The bad communication is the worst of it, and it's really frustrating as a commissioner to be in the dark on things, especially for so long. Positive feedback from hawlucha on Tue, 16 Sep 2014 07:39:12 -0500: I bought from anaildapinto. Positive feedback from joy_dust on Fri, 12 Sep 2014 00:10:18 -0500: I bought from anaildapinto. This is the 2nd time that I've commissioned anaildapinto for a handmade keychain and I'm very much happy with how the items turn out! Great communication as always and such a pleasant person to work with. Thank you so much! Will definitely be commissioning more keychains in the future! Positive feedback from silverinfinity on Sun, 31 Aug 2014 16:23:26 -0500: I bought from anaildapinto. Positive feedback from blupanther on Thu, 28 Aug 2014 09:20:07 -0500: I bought from anaildapinto. Commissioned a double team keychain. Great service and product. Thanks again! Positive feedback from joy_dust on Tue, 26 Aug 2014 13:25:21 -0500: I bought from anaildapinto. I commissioned a Double Team Keychain and it arrived today! It's well-detailed and simple adorable! A great addition to my collection and the seller was great to work with! Thanks! Positive feedback from coiffwaff on Sun, 24 Aug 2014 05:47:11 -0500: I bought from anaildapinto. Bought a custom Furfrou keychain. Item arrived in great condition and I am very pleased with the final product. Thank you! Positive feedback from cosmicxlove on Mon, 18 Aug 2014 16:12:10 -0500: I bought from anaildapinto. purchased a double team keychain from them, and I'm beyond happy with the service she gave, along with the end result! Positive feedback from j_degnan on Tue, 12 Aug 2014 01:13:03 -0500: I bought from anaildapinto. Anaildapinto made me a stunning A5 Lance and Dragonite artwork. It arrived within two weeks. I'm very happy. Positive feedback from yellow_fr3ak on Tue, 29 Jul 2014 11:57:25 -0500 for this transaction: I bought from anaildapinto. Positive feedback from peppermmints on Sat, 26 Jul 2014 08:53:25 -0500: I bought from anaildapinto. Bought a custom double team keychain. Lovely seller to work with, got my keychain made and shipped quickly. Very high quality custom work, and even included the original sketches. Positive feedback from latias_latios_7 on Sat, 19 Jul 2014 20:44:57 -0500: I bought from anaildapinto. Positive feedback from solishark on Fri, 11 Jul 2014 17:35:49 -0500: I bought from anaildapinto. Commissioned a shiny venusaur keychain. Great communication and very happy to add it to my collection. It looks great! Positive feedback from riolu on Sun, 29 Jun 2014 13:23:06 -0500: I bought from anaildapinto. Great communication. Kept me updated at every step. The keychains turned out amazing! Highly recommended. Positive feedback from chromapika on Fri, 20 Jun 2014 18:54:08 -0500: I bought from anaildapinto. Positive feedback from themessyness on Tue, 17 Jun 2014 08:15:43 -0500: I bought from anaildapinto. Positive feedback from sheriphie on Thu, 6 Feb 2014 23:49:47 -0600: I bought from anaildapinto. Purchased a custom keychain! Seller has great communication and customer service. Very recommended! I'll definitely buy again!! Positive feedback from poketr on Tue, 30 Jul 2013 12:05:42 -0500: I bought from anaildapinto. Thanks so much for the Wartortle Card! Glad it finally arrived after the post office originally lost it! Positive feedback from trigris on Wed, 8 May 2013 17:11:41 -0500: I bought from anaildapinto. I bought a custom feraligatr keychain, communication was great and I got to pick out the design :) Amazing work! Positive feedback from remderosier on Wed, 20 Mar 2013 21:56:32 -0500: I bought from anaildapinto. I ordered three custom keychains from anaildapinto. They look AMAZING and came very quickly. Would definitely recommend! Positive feedback from shuuichi_chan on Mon, 25 Feb 2013 11:07:24 -0600: I bought from anaildapinto. Bought a custom Swampert keychain. User has wonderful communication and great custom making skills! Very happy. Positive feedback from rykerr1 on Thu, 14 Feb 2013 15:51:24 -0600: I bought from anaildapinto. Bought a custom shiny Sceptile keychain. Communication was great and I loved that I got to choose from two designs. It arrived really quickly and ended up looking awesome. Thanks so much! Positive feedback from straydogstarbck on Sat, 9 Feb 2013 16:15:22 -0600 for this transaction: I bought from anaildapinto. 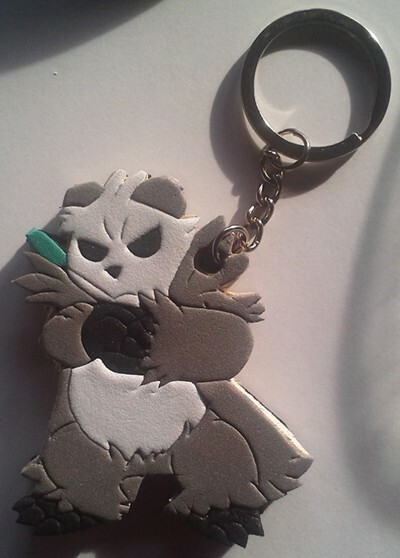 Commissioned a custom Mightyena keychain! Seller was prompt, friendly, and wonderful to work with, always great with communication and went out of her way to make sure I'd be happy with the product. Adorable, quality item! Thanks again! Positive feedback from themessyness on Thu, 7 Feb 2013 18:45:28 -0600: I bought from anaildapinto. Positive feedback from soulhowlx on Mon, 4 Feb 2013 10:16:05 -0600: I bought from anaildapinto. Commissioned a custom Yveltal piece! Turned out beautifully and the transaction was very smooth. Super friendly person, pleasure to do business with! Thanks so much! Positive feedback from kitzune on Sat, 2 Feb 2013 04:17:38 -0600: I bought from anaildapinto. I commissioned a custom Minccino keychain. Communication was very fast. Shipped soon after completion. Arrived about a week later. Very happy with the end product! Thank you! Positive feedback from austerlitze on Wed, 30 Jan 2013 16:14:08 -0600: I bought from anaildapinto. Especially friendly and fast shipping! Thank you so much for the smooth transaction! Positive feedback from noksum on Mon, 28 Jan 2013 18:53:02 -0600: I participated in a GA with anaildapinto. Participated in a GA co-hosted by anaildapinto. Positive feedback from arcanine5860 on Mon, 28 Jan 2013 16:56:11 -0600: I bought from anaildapinto. Great seller, and amazing artist! Arcanine is so detailed and lovely =D Anaildapinto also kept up communication and let me know when the keychain was completed, when it was shipped, etc. - very much appreciated! Thank you! Positive feedback from chaos_21 on Thu, 17 Jan 2013 10:49:32 -0600: I participated in a GA with anaildapinto. Fantastic GA host! Thank you for making this a success! Love my plush!! Cheers!! Positive feedback from derpncheez on Fri, 21 Dec 2012 16:17:34 -0600 for this transaction: I participated in a GA with anaildapinto. Great GA host! Was an awesome and pretty easy thing for my first participation in a GA! Positive feedback from acidmimi on Fri, 21 Dec 2012 08:16:44 -0600: I participated in a GA with anaildapinto. Positive feedback from markkuu on Fri, 21 Dec 2012 05:51:07 -0600: I participated in a GA with anaildapinto. Good GA host! Thanks a lot! Positive feedback from yaoi_queen on Fri, 21 Dec 2012 03:01:07 -0600: I participated in a GA with anaildapinto. Positive feedback from coldrig on Thu, 20 Dec 2012 02:10:49 -0600 for this transaction: I participated in a GA with anaildapinto. Participated in a GA co-hosted by anaildapinto! Positive feedback from colocho_robotto on Tue, 18 Dec 2012 09:54:09 -0600 for this transaction: I participated in a GA with anaildapinto. Positive feedback from entirelycliched on Tue, 18 Dec 2012 07:07:13 -0600 for this transaction: I participated in a GA with anaildapinto. Excellent GA co-host! Learned very quickly, was friendly, and was very good at maintaining contact.